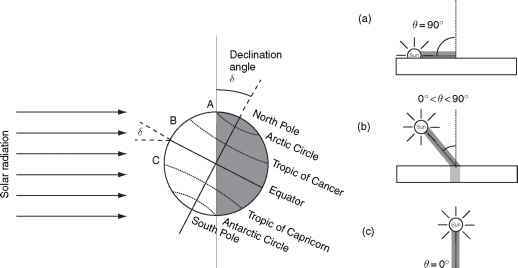 Predation is often a strong top-down force in ecosystems mediating coexistence of lower trophic-level species by preventing competitive exclusion among ecologically similar organisms. In fact, predators often maintain species diversity in ecological communities by preventing expansions of certain prey that would otherwise outcompete competitively inferior organisms and come to dominate the community. If important predators are removed from a food web, the absence of their strong effects can ripple throughout the system, fundamentally altering a variety of predator-prey interactions. 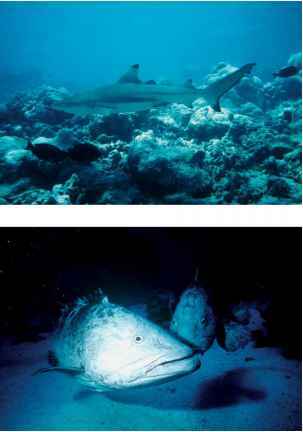 Figure 4 Apex predators like sharks (top) and groupers (bottom) are now rare on many coral reefs due to overfishing. Photo credit M.E. Hay. have had strong cascading effects on reefs. Further, surveys of lightly fished reefs in the northwestern Hawaiian Islands showed that large apex predators such as sharks and jacks represented >50% of the total fish biomass as compared to <3% on heavily fished reefs from the main Hawaiian Islands. These abundant apex predators on lightly fished reefs surely exert a strong top-down force on the community structure of these reefs. However, the human exploitation of medium-sized predatory fishes has given us the best insight into how predation influences reef communities. On many Pacific coral reefs, outbreaks of the crown-of-thorns starfish, Acanthaster planci, cause loss of many square kilometers of coral reefs. These starfish are voracious coral predators that forage in large groups of up to hundreds of thousands of individuals that can decimate large stands of coral, and their outbreaks have become more frequent since the 1960s when they were first documented. Research in the Fiji islands has shown that outbreaks of Acanthaster are correlated to fishing pressure on reefs. Acanthaster are 1000 times more dense around islands that have high fishing pressure and low predatory fish abundance than they are on reefs that have light fishing pressure and high predator abundance. High densities of Acanthaster decrease cover of reef-building corals and crustose coralline algae while increasing cover of filamentous algae. Thus, the removal of large predators is associated with explosions of Acanthaster populations that then have strong cascading effects on the organization of reef communities. A similar situation exists on many reefs in eastern Africa where intense fishing of triggerfishes and large wrasses allows population explosions of sea urchins such as Echinometra mathaei. Reefs unprotected from fishing have six times more urchins than protected reefs, and feeding by these dense urchin populations physically erodes the reef structure once most of the algal biomass has been consumed. This intense grazing decreases coral cover and diversity as well as increases bioerosion rates up to 20-fold compared to reefs that are protected from fishing and have abundant predators. When formerly fished areas were protected from fishing, urchin-eating fishes became more abundant and predation on urchins increased, suggesting that recovery of predatory fish populations should lead to lower urchin populations and a recovery of reef structure over time.